Dataguide is the single source for all your envelope printing and professionally printed products. Don't waste time on some on line envelope printing site trying to figure out how to make it work only to find you can't get the design to match the rest of your stationery, and the pricing is not as competitive as they claim. Have your envelope printing done by the professionals at Dataguide, give us your logo, we'll do the design work and provide a complete proof for your approval. Spend your time focused on your core business instead of wasting hours uploading artwork and creating your own envelope template. At Dataguide we'll do the work for your envelope printing and chances are it will cost you less. As a distributor Dataguide has a unique advantage when handling your envelope printing project. The cost of your envelopes is primarily driven by the equipment used to print those envelopes. Some equipment is suited to producing large orders in one or two color at high speed. Other equipment is best suited to handle small envelope orders; using the right equipment reduces the cost. Dataguide partners with numerous wholesale envelope manufacturers around the country all of whom are very competitive within a particular envelope printing niche. These partnerships ensure that each envelope order will be produced on the most efficient equipment and the most convenient location at the lowest possible cost. Our partners include both envelope printers, envelope converters, and custom envelope manufacturers. 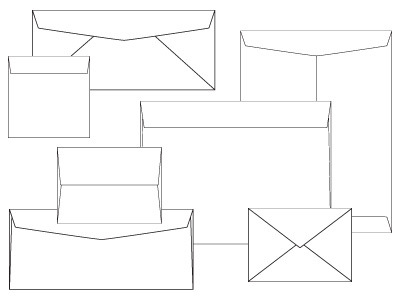 Small envelope orders are usually produced by printing on existing blank envelope stock. For larger envelope orders the envelopes are actually made from raw paper stock and printed at the same time for maximum efficiency. In some cases custom dies are required to create unusual size or shaped envelopes, these custom envelopes have to die cut as well as being converted and printed and require specialized equipment in order to produce the envelope at the lowest cost. As an independent distributor Dataguide is the best source for your envelope printing project for numerous reasons. We partner with the best wholesale manufacturers in the country to ensure your envelope printing project is produced on the right equipment at the lowest possible cost. We can provide you with an on line ordering platform, at no additional charge, that allows you to manage all your envelopes and printing and promotional items in a single web portal. To find out more how our Point'N Click portal can save you hours each week visit our ecommerce solutions page.